Happy birthday Tenny! Woke up early but took it pretty easy getting ready for the day. We had less than 30 miles to Yuma and 2 days to get there so we didn’t feel too pressured. After exiting the campground, we immediately rejoined our favorite, the All-American Canal. Woo! It’s always nice to walk along the water, gorgeous, deep blue-green and clear. A man was standing on the banks taking advantage of the canal fishing. We were told there are stripers and catfish. Glad someone was enjoying! We’re on the fringes of the Imperial Sand Dunes, which, as we learn, are kinda a big deal out here. 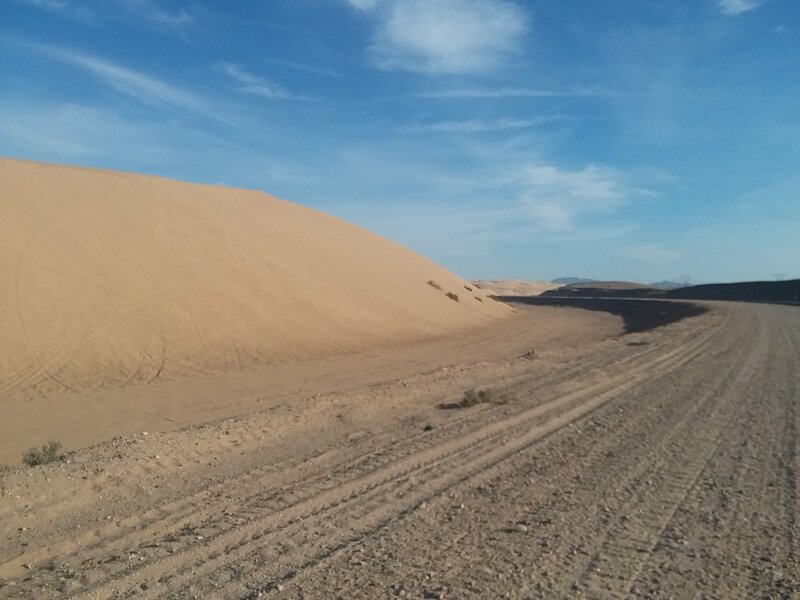 There’s a whole subgroup of people known as “Duners”, a crowd that slams this area during the cooler winter months and spends their time exploring the dunes and surrounding roads on OTVs. During Thanksgiving, over 100,000 people descend on the area to play, and from what we can tell, it’s a close and loyal community. We don’t get the chance to meet many, but we hear the noise from their rides all day. Unfortunately, the canal is surrounded on both sides by steep, 20 foot sand banks and our visibility is limited to the water and the dirt road on either side. We’re trying our best to stay curious and alert to our surroundings during the day but there’s not much here, other than the water. It’s easy to fall into the hiking trance, and hours go by this way. What, what happened? It’s hot and the footing keeps switching back and forth between good road and sand, and it requires a certain level of concentration to maximize firm footing. The cool, deep waters of the canal beckon, but every time we’re about to say screw it and jump in, a dramatic sign with a drowning figure pops up offering all kinds of dire warnings. A Lyft driver of ours claimed that the water can sometimes get up to a speed of 90mph and we’ve heard that a number of people have drowned trying to cross. At the height of the midday heat, Tenny climbed down a ladder that led to the canal water’s surface to dunk her shirt. The water was perfect and the following hours were much more pleasant. At long last we reach the turnoff from the canal that will take us north to our campsite for the night. The canal has been steadily angling towards the border and as we turn we can finally see the outline of the wall highlighted against the horizon. Sure enough, about 3 minutes later a Border Patrol car stops next to us to get the story on what we’re doing out here. He has a Panda Express take out bag in his passenger seat and we seriously consider asking for directions. Only a day out of town and we’re jonesing! The road climbs and gives us a brief peek into the dunes, which are covered in tracks and look super fun. There’s a lot of traffic out here; border patrol, park rangers, and duners, and we can see the gas station we’re headed for in the distance. We’re not exactly sure where we’re camping so we check in with the campground host at the RV Park. Joanne is nice and bubbly and comments that “we won’t get any complaints from her” when we tell her that we’re hiking the border. When her husband Roy joins us they both claim, with no urging, to be totally against the wall. He hands us a pair of binoculars and points to Pilot Knob where three crosses are perched on top of a gnarly looking peak. He tells us that helicopters monitor the peak at night with spotlights. For migrants? Roy and Joanne live here in the winter and they tell us more stories about the various experiences they’ve had being so close to the border and how utterly foolish it is to view our neighbors so suspiciously. “Everyone is just trying to have a better life” as Joanne said. They have only met 2 migrants trying to cross, although the mountains are supposedly a popular spot. They also recalled a time when it was much easier to cross the border as Americans. Originally, they only had to show a driver’s license, then the process became more and more difficult, requiring a birth certificate at one point and now of course a passport. Unfortunately, we can’t stay there for the night (apparently most RV parks don’t allow tent camping which is absurd) but they tell us to go just past the fence to the BLM land. We say goodbye with mutual expressions of admiration. And then there’s a gas station! It’s a special kind of treat to run into civilization mid-hike. Bathrooms, running water, and cold drinks. Perfection. We sit on the curb outside looking like bums drinking our drinks and making phone calls. The gas station sells beer, our campsite is only a short distance away, and it’s Tenny’s birthday. Oh and tonight is the super moon! The perfect alignment of circumstances. We amble a short distance into the bush and set up camp. We can still see and hear the interstate but of all the campsites we’ve had on this trip, this feels the safest. No one will bother us out here. We usually try to be stealthy at night but tonight it’s a party. We crack open our beer, lie back on our packs, and, for the first time on this trip, play music through our phone’s speaker. The stars come out and an enormous moon slowly rises and it’s about as perfect as it gets.